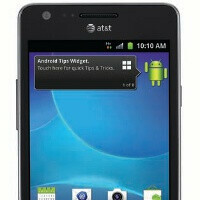 AT&T has just set the bar high for its 4G LTE smartphones - it has announced the Samsung Galaxy S II Skyrocket, an LTE-enabled handset with a spacious 4.5-inch Super AMOLED Plus display with a resolution of 480x800 pixels. 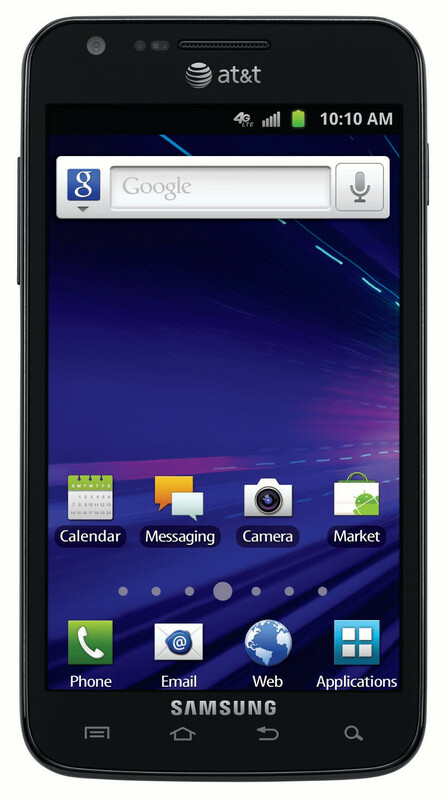 The handset runs on Android 2.3.5 Gingerbread and under the hood, a 1.5GHz dual-core processors makes it tick. An 8-megapixel rear camera allows capturing video in 1080p, while up front there’s a 2-megapixel snapper. 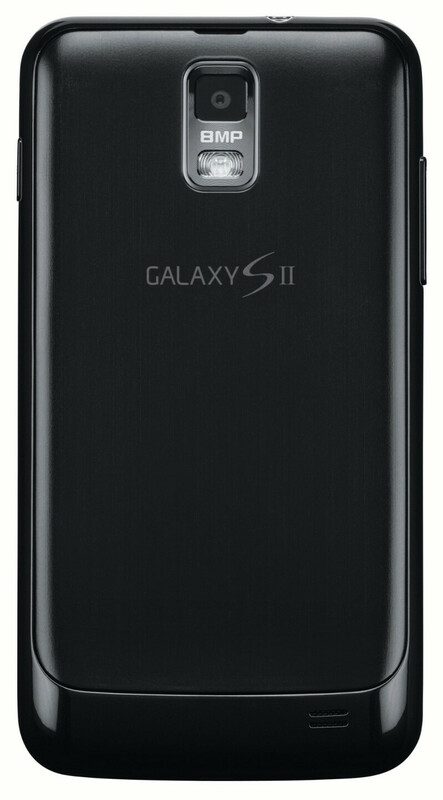 The Galaxy S II Skyrocket features 16B of on-board memory, expandable via a microSD card by up to an additional 32 gigs. The Galaxy S II Skyrocket release date is set for November 6th while the price will accordingly skyrocket to $249.99 when the phone is purchased with a two-year contract. The carrier has also said that it's expanding its LTE network to Boston, Washington DC, Baltimore and Athens GA, effective November 6th as well. colorful screen on the market. and online Nov. 6 for $249.99 with a two-year commitment. But is it an exynos? Add in the fact that ATT's LTE is in like 2 markets and barely working and this phone is a total SKIP. Get the regular SGS2.. its better in every way. you only lose about 0.2 inches of screen estate which isnt much. I checked out the AT&T and T-Mo/Sprint versions of the S II at Best Buy a few weeks ago. The AT&T version felt just right while the T-Mo/Sprint 4.5" ones were too wide. And 4.5" at 800x480? Can you say pixelation? pixelation isnt so much of an issue because of the pixel density of the SA+ screen.. its still pretty to look at. Its the sub par crapdragon processor that pisses me off. If its not exynos, why the hell would u buy it!? The colors may be pretty, but the sharpness leaves a lot to be desired. Everyone's been drooling over Super AMOLED Plus because it's an RGB stripe matrix, but that doesn't change the fact that it's low resolution by 2011 standards. On a 4.52" screen that's only 206 ppi. 50% more subpixels don't make up for lack of pixels. I bought my SG SII a little over a week ago, rooted it and loaded CyanogenMod 7 on it. Hands down the fasted phone on the market right now. I absolutely agree remixfa, that the exynos would put any other processor to shame. My fasted quadrant benchmark is 3981 with no overclocking. so better in every way...except being incompatible with the better network tech? In 6 months to a year there'll be large LTE network backing this thing while the Exynos version is still stuck on HSPA+ And then what's the GSII left with? smoother scrolling so its owners can flick up and down a webpage like a really boring crackhead going "omg it's so smooth!?" I'm just sayin, all these recent dual core devices can already get everything done in about the same speed -As long as the network allows them- and in this case I think I'd want a quicker network than a better optimized CPU that doesn't net me any real benefit. remixfa: Dude are you SERIOUS?????... I normally agree with most of your comments but you took me back with this one. Are you stating that someone should settle for bogus HSPA+ with BACKHAUL and skip getting into true LTE because they don't get an EXYNOS chip? That doesn't hold firm to me. The fact that the EXYNOS chip is incapable of clocking in at 1.5ghz and incapable of LTE support, makes me feel that it is not up to date with the most optimum data standard that is currently available. I have grown to respect your wisdom, so please advise. trust me (and remixfa), you want the exynos chip. the snapdragon processor doesnt hold a candle to it. I dont care what the new sgs2 have. BTW, the exynos chip can overclock to 1.6 comfortably. 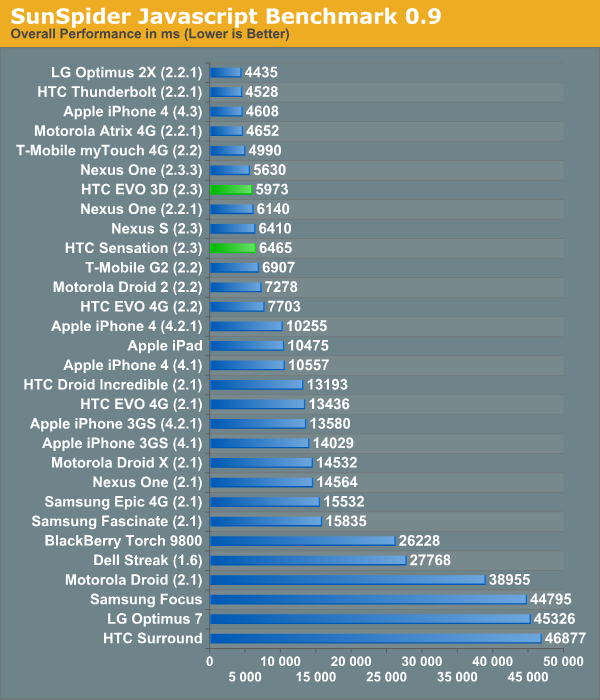 The snapdragon just needs to be bumped to that degree so it doesnt look incredibly slow in comparison. the clock frequency hardly matters when comparing SoCs as different as Exynos and Qualcomm's S3 variants. even at 1.5GHz an S3 can't perform as well as even a 1GHz OMAP4 which is truly sad because even though it still can't beat an OMAP4 at that frequency it still eats battery because it's higher. given the choice between data speeds and processing power i choose processing power nearly every time because in this day and age Wi-Fi is offered in more than enough places to even justify sticking with 3G if you have to. i'm not saying data speeds aren't important i'm saying that data speeds are easily remedied while processing power is not especially with an S3. How do you know for sure it's not? I mean they announced not too long ago the 1.5 GHZ dual-core Exynos for South Korea's LTE network. It is a possibility. Not saying it's a high one, just saying it's out there. ok, for clarification the exynos can only go to 1.4ghz (officially) it its current configuration the next exynos 4212 dual core chip that is launching early next year is on a smaller die size which draws like 25% less power than it already does, but has an increased processing rate (from the smaller size) as well as a bigger GPU. Reportedly, its 50% stronger than the current Exynos GPU which is no slouch. That Exynos is supposed to go from 1.5ghz up to 2.0ghz. We arent even talking exynos quad cores yet. ;) choupino.. If you are worried about the network in a year from now, then you should get a phone in a year from now when both the crapdragon S3 and the exynos 4210 chip will be old hat and bargain phones. If you are buying a phone right now, then you want the processing power. 1) it will be an EVEN BIGGER increase in power when the SGS2 gets it's upgrade to ICS which is meant for dual cores 2) the exynos gets a huge increase in battery life compared to the snapdragon S3 (at 1.2... its a joke when you compare it at 1.5ghz.. lol) 3) HSPA+ "backhaul" can go up to 21mb/s if ATT does the basic software upgrade on the network to allow it. Ive seen 2mpbs, 5mb/s, 10mb/s,20mb/s and 30mb/s. TRUST me when I tell you that anything in the double didgets is INSTANT to your phone. At that point you are more limited by PROCESSING POWER than by NETWORK SPEED... So yea, that S3 enabled LTE phone might get higher network speeds, but the exynos enabled device will PROCESS that data faster. So for web browsing, if one is running at 14mb/s and the other is running LTE at 30mb/s.. they will either feel the same, or the exynos will still "feel" faster because it can chew up the info quicker than the S3 crapdragon. Do you care more about a "speedtest.net score" or actual daily use? And dont forget unless you actually LIVE in one of ATT's tiny LTE markets (all 2 or 3 of em), you will just be eating extra battery since it will be searching for LTE signal.. further degrading battery life. And according to ATT, it cant "roll out" too many LTE markets without the Tmobile merger... so you better be praying for that. That is a whole lot of "what ifs" and "maybes" to trade for guaranteed performance. Can you say my new PHONE!! !..so glad i waited!!!! But does it have a bigger battery? I say let the early adopters take this beast for a test spin before making your decision on it. AT&T's LTE is just being born...(Think Thunderbolt on VZW; it was a great phone, but had reception issues and terrible battery life). Hopefully AT&T has learned from VZW, but I still say wait for some real-world battery and performance tests. This is basically a repackaged GSII with LTE, larger screen, and different processor, if you need an Android phone now, get the tested and well-performing GSII. yes, its the hercules with LTE. blaaah.. its loaded with a crapdragon. 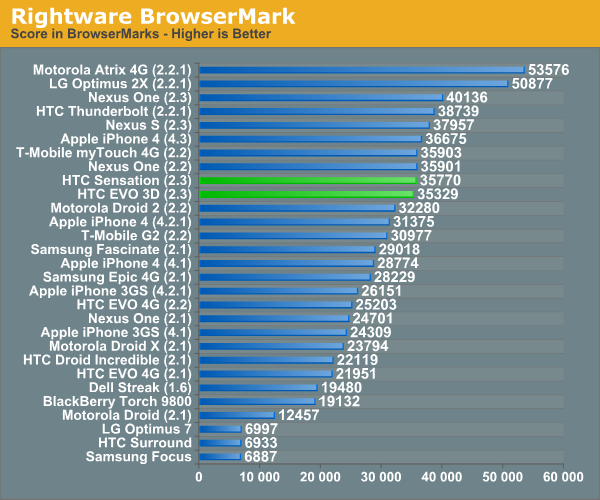 I agree that the Snapdragon hypes its performance with high clock values, but it's by no means a terrible SoC. Let's wait for real tests to decide this one. comparitively its the weakest dual core on the market. Its weaker in many tests than an optimized single core hummingbird. The tests have already been done. just find the comparison tests between the stock SGS2 and the Tmobile Hercules SGS2 to see the difference of the same set up with the only difference being an exynos vs snapdragon. This variant is nothing more than the hercules with LTE instead of 42mb/s hspa+. Do you have a link proving your claims? Also, please don't tell me that "optimized single core hummingbird" means over clocked, as that should not be part of this comparison. I'm merely saying that we have no idea how the 1.5 dual Snappy will perform with AT&T's new LTE network...maybe they, too, will be "optimized." his comparison of the Hummingbird and the S3 has everything to do with the discussion because it gives you a better idea of how bad the S3s are. it's no exaggeration, an optimal Hummingbird core can perform better than an S3. the fact that the S3 will be used tandem here with LTE means nothing. an S3 is an S3 and S3s are bad. i think they should've used an OMAP with this. LTE has proven itself with OMAP4s and it would make for a more tempting offer sitting next to AT&T's original Galaxy S II. Confused by your hypocritical statements: "the fact that the S3 will be used tandem here with LTE means nothing" "LTE has proven itself with OMAP4s" Why does using a S3 with LTE mean nothing, yet an OMAP4 with LTE has "proven itself?" My comment about the S3 and LTE being "optimized" was more of a jab. And once again, you and remixfa fail to display a reputable source showing an "optimal" Hummingbird core as better than S3. What is this "optimal" and "optimized" nonsense? Can you actually define what that means? Whimsical, Nonsensical terms mean absolutely nothing without real-world data. I'm not really arguing with you, I'm basically saying, "Show me the Carfax." 1. "the fact that the S3 will be used in tandem here with LTE means nothing." i mean that even though this GSII does have LTE it doesn't change how bad the S3 is. it doesn't affect it's performance at all. it might affect LTE performance but not the other way around. 2. "LTE has proven itself with OMAP4s" the OMAP4 as i'm sure you probably know by now is the second best SoC available and it's been used with LTE a handful of times and they work fine together. it would've been ideal for that combination to have been made here. i think remixfa actually HAS the proof. you'll have to ask him. exynos vs snapdragon browser benchmark http://www.youtube.com/watch?v=6eV1NlokuBc keep in mind, on these anandtech graphs, you are comparing a STOCK HUMMINGBIRD 1ghz vs a 1.2ghz Snapdragon S3 using Sensation AND Evo3D, yet the hummingbird either out performs or stays right with the dual core S3. Sunspider testhttp://images.anandtech.com/graphs/graph4416/38185.png http://images.anandtech.com/graphs/graph4416/38186.png http://images.anandtech.com/graphs/graph4416/38183.png SMARTBENCH HTC SENSATION, snapdragon S3 at 1.2ghz http://smartphonebenchmarks.com/index.php?filter_model=HTC+Sensation&filter_benchmarkapp=Smartbench2011%3AGames&filter_cpu=all&filter_gpu=all SAMSUNG VIBRANT Humminbird Optimized at 1.2ghz. 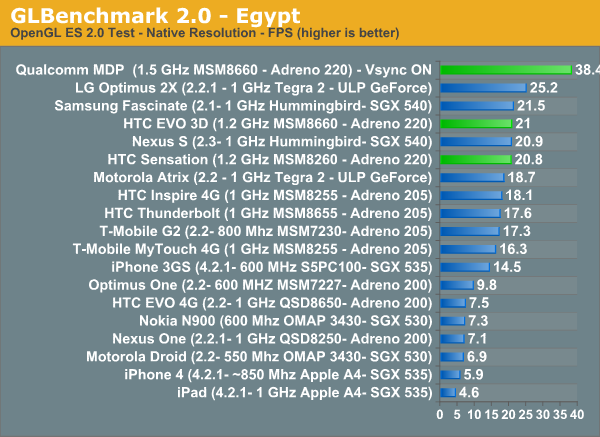 http://smartphonebenchmarks.com/index.php?sort=score&sort_order=DESC&filter_model=Samsung%20Vibrant&filter_benchmarkapp=Smartbench2011:Games&filter_cpu=all&filter_gpu=all&limit_from=50&limit_from=75 Running the same test, at the same frequency, with both of them being optimized by the best ROMS that the world has to offer, the Snapdragon S3 scores around 2400 on the 3D test while the single core Hummingbird scores over 2800 at the same 1.2ghz clock frequency. On my own in store comparisons between my vibrant which runs an optimized (aka ext4 file system found in gingerbread) hummingbird at 1.0ghz, vs the stock gingerbread Sensation with a dual core snapdragon s3 chip clocked @ 1.2ghz... running the NENAMARK 3D polygon test, my Vibrant runs at about 50+FPS where the Sensation runs around 24 FPS. And I get a MUCH MUCH better battery life out of it. The reason we keep stressing "Optimized" on the hummingbird, is that on the SGS1 and all its variants (NexusS not included), Samsung saw fit to use an antiquated RFS filing system. When gingerbread 2.3 rolled out it forced all filesystems to change to EXT4, which is a much faster file system. Faster access to files is all part of faster processing. The Hummingbird went from "above avearge" to "freaking speed demon" with that simple change. And if you happen to have an american SGS1 variant that doesnt have 2.3, a 5 minute simple XDA fix will cure that. So, long story short, me trading in my SGS1 for a Snapdragon S3 ANYTHING is either a downgrade or a side-grade... but it is most definately NOT an upgrade.